telophase | WOULD ANYONE LIKE A KITTEN? WOULD ANYONE LIKE A KITTEN? Well, anyone in North Texas that is. Part of the reason I've been scarce around here lately is that I've been occupied with a family of feral cats that took up residence in our back yard. Mama there raised a previous brood in your yard, but we didn't see them until they were too old to adopt, but too young to trap and take to the local barn cat rescue. And then they moved on. A few months later, and another brood shows up, but this time with the kittens the right age to bumble along with triangular tails, starting to eat solid food, and annoying Mama enough with wanting to nurse that she was starting to wean them by getting up and walking away when she'd had enough. 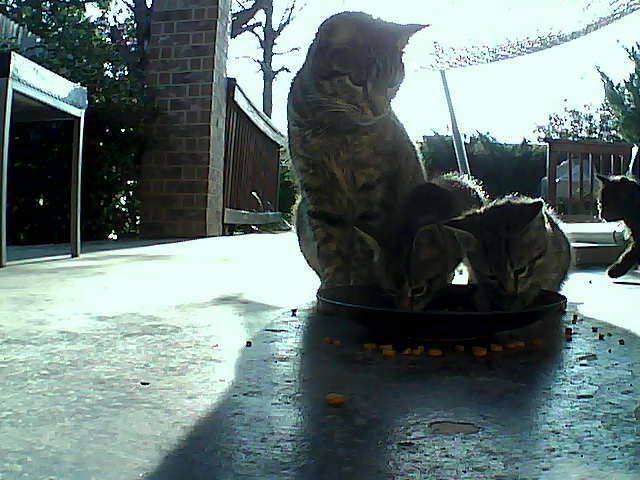 So we borrowed traps from a coworker who's heavily involved with the campus TNR (trap-neuter-release), fed the cats on the back porch in front of the spycam for a few days to see how many there were and to get them used to coming to the porch for food, then set to it. Caught Mom and Dad right off. The kitten were another issue. The coworker who'd loaned the traps also loaned us a kitty condo (big cage, basically), so we put Mama's trap in there and rigged a rope to pull the door shut, and fed the rope through the space at the bottom of the back door where the weatherstripping is busted and we hadn't had a chance to fix it yet. I slept literally 2 hours that night as I couldn't get to sleep from anxiety, and I kept getting up to check on the cats. 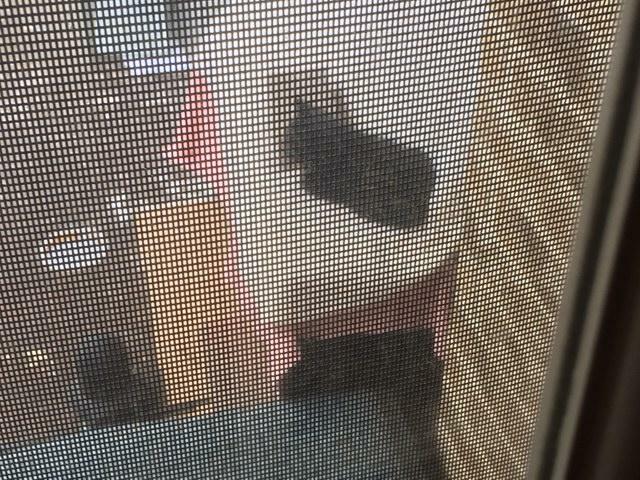 At 4:30, I got up and lo and behold, there was a kitten pile in the condo next to Mama! I pulled the rope and...well, one escaped. So I locked the door on the four remaining and went back to bed. Back to bed to not sleep until 6:30, when I got up and Toby and I fed the kittens (well, provided food and water that they trampled all over the cage, of course) wrangled Mom and Dad into the car, and took them to TCAP, a local organization that offers free spay/neuter for feral cats...if you're one of the first 12 to show up for the day. You have to pay for a rabies shot, pain meds, ear tipping, etc. but the upshot was that I paid $20 to get Mom and Dad fixed. But that's not the end of the story. We still had an escapee. I got Toby to drive me back to TCAP at the end of the day because I was so loopy that I started to melt butter to make scrambled eggs, then wandered off and started watching TV and forgot about the butter until I heard it sizzle, wondered what Sora was doing to make that noise, and went to investigate. Oops. I realized that driving and cooking were activities off the table for me for the rest of the day. We got the adults and ensconced them in the garage. 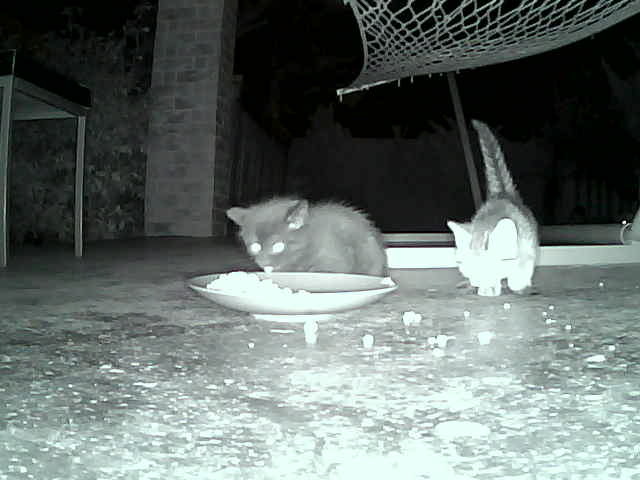 The kittens moved back out to the back porch to tempt their sibling. We had a kitten trap, but it was too new and the weight of the kitten didn't trip it. Mama was released as well, although the camera shows that she's been lurking around, trying to figure out how to get her babies back. Awesome, right? For a short time. Yesterday morning, another kitten escaped when I was trying to get into the cage to clean their litterbox. My coworker offered to take them off our hands since she has a shed they can be safe in, and came to get the condo and its fuzzy payload. We baited three traps and left the on the porch. We caught Mama. We let her go, and re-baited. We caught Mama again. But this time we also caught the escapee! And let Mama go again. The escapee spent last night in the trap in our garage, and is currently on the back porch since we have guys painting our garage. And is also chirping loudly for Mama. I'm going to meet my coworker at 4 to accomplish the handover and after that...hopefully things will be ALL OK FOREVER. We have nicknamed them from Tinker, Tailor, Soldier, Spy. Mama is Control because she is in charge of the whole Circus. The first escapee, one of the black kittens, is Tailor for reasons that will be clear if you've read the book or seen the movie. The second escapee, a tabby, is Smiley, because it ran home to Control. The other three are randomly Tinker, Soldier, and Poor Man. Which leaves Papa as Prideaux. Tailor has a set of lungs. When we trapped him (her? 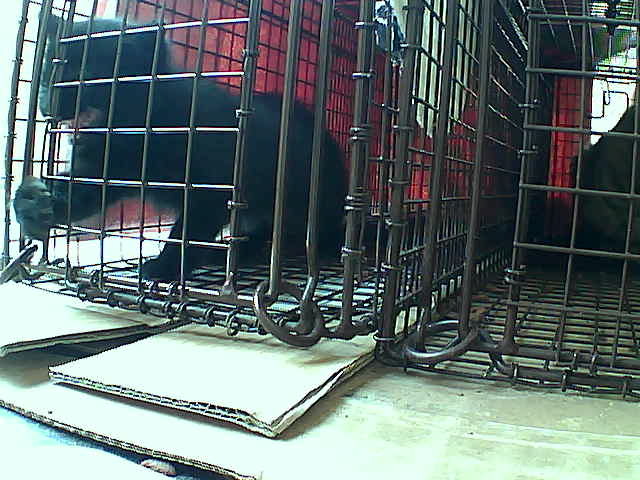 ), he squawked like the hounds of Hell had him by the throat before we'd even TOUCHED the cage. I'm surprised the neighbors didn't show up demanding to know what we were doing to that poor cat. I told this to my coworker as she was picking them up, and an hour later she texted me with WE KNOW WHICH ONE IS TAILOR. So! Anyone in North Texas want a kitten? Know anyone in North Texas who wants a kitten? I WILL DELIVER IF NECESSARY. They're being fostered to teach them manners and after that will be lovely companions for you. Here is an Imgur album of kitten photos. Mostly out of order, but hey. Sora and Nefer have been extra-needy and squirrely lately, obviously. Especially the 24 hours that our garage reeked of feral tomcat. We got four Feliway dispensers and have plugged them in around the house and hope that helps to calm them down. We appreciate them a whole lot more right now! Aww, they're adorable! Unfortunately I am a) not in Texas and b) already have reached the household limit on cats I can have. But good on you for going to such effort to catch and take care of them! Thanks! I'm hoping we can get them adopted out over the next few weeks. They're tiny and cute, albeit angry and hissy at the moment, so after a bit of fostering to get over their fear of humans, they should hopefully be very adoptable.